It is thought that the Bernese Mountain Dog was a cross between farm dogs from the Swiss Alps and the Mastiff-type dog, the Molosser, that the Romans brought with them when they invaded the Alps in the first Century B.C. The Berner (as they are affectionately called) worked on Swiss farms for hundreds of years pulling carts, driving livestock, and providing loyal companionship to their families. The breed was named for the Canton of Bern in Switzerland. They were brought to America in the mid 1900s. 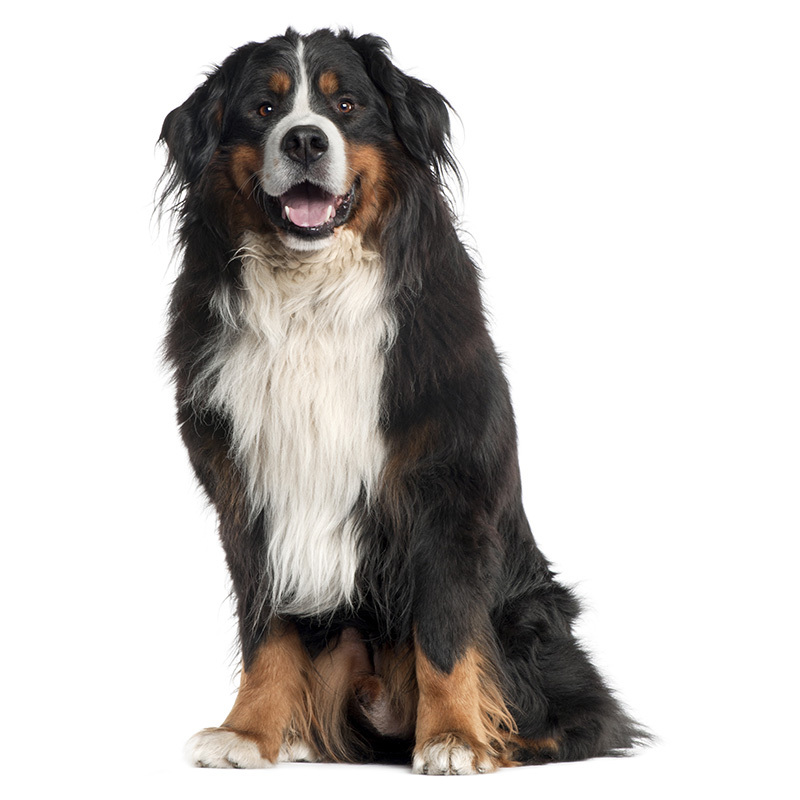 The Bernese Mountain Dog makes a great family dog, as they are loyal, devoted, and strive to please you. They usually single out one person in the family to be their best friend. These dogs are very intelligent, easygoing, good natured, loving, and docile. They make good watchdogs, and will announce any stranger that comes to the door. Bernese Mountain Dogs need daily exercise; however, they don’t really like playing fetch or going for runs with their owners. Properly trained and socialized, a Bernese is excellent with children. These dogs make wonderful family dogs, as they are devoted to their family and love to be with them. Bernies usually weigh between 70 to 115 pounds and stand approximately 23 to 28 inches tall. They are a large dog with a compact, muscular body. Their coats are thick, long, silky, and can be either straight or slightly wavy. Colors range from black, brownish red, and white tricolor pattern. Bernese Mountain Dogs are quirky dogs who crave love and affection. They love to lean against people and sit on their feet. They love to dig to try to get into the cool earth, so you might want to watch your flower beds. Bernies are slow to mature and can act like a puppy for several years.